Lanani and Associates Karachi Pakistan starts immigration process to Canada for professional skilled workers, Canadian Government starts applications under federal skilled worker program for 50 selective occupations. 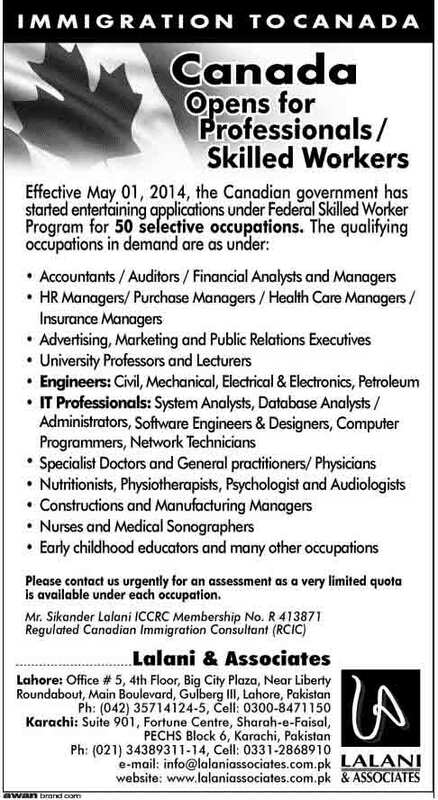 The qualify occupation in demand are as under: Accountants, Doctors, Auditors, Financial Analysts and managers, insurance managers, advertising, marketing and public relationship officers, nurses and many more faculties are required by Government of Canada. Devisers Law Chambers offer Canada opportunities for Nurses, Teachers, Accountants, Financial Advisers. contact now Devisers, the Daily Jang News paper date 09 July 2018 Page number 6. the good benefit and salary package will be offered to right candidates, the benefits are move with family, free education for children, Full time work, and free medical for family. the head office of devisers law chambers is in London United kingdom and sub office is in Karachi city of Pakistan.